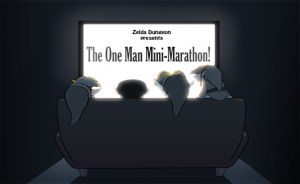 Last April here at Zelda Dungeon I hosted the first One Man Mini Marathon. This surmounted to me playing through, The Legend of Zelda, The Adventure of Link, A Link to the Past, Link’s Awakening, and Ocarina of Time, all back-to-back, without a single break. While I had others at the event to help with commentary, (and my sanity), I was the only person to actually touch the controller during the gameplay. All in all, it ended up taking about 23-hours to complete the mini-marathon, as sleep deprevision caused my Ocarina of Time play to significantly suffer in the later half of the stream. Throughout the marathon we raised money for a fundraiser for a local video game arcade in Chicagoland area known as the Galloping Ghost Arcade. Having raised over $2500, and I myself matching the donations, our $5000 donation has allowed the arcade to expand, and it now houses over 440 different arcade games, becoming the largest arcade in the world. It’s now time to look ahead to the 2015 One Man Mini-Marathon and I need your help. Go ahead and make the jump to find out some more information. Having completed the first five-Zelda games, I’m ready to take on the challenge of either additional games, or additional challenges for the existing games. Currently I’ve been debating between a few potential ideas, but I wanted to get your opinions. Option 1: Completing the same first 5-Zelda Games… AND adding both Oracle of Seasons and Oracle of Ages to the rotation, along with the combined ending. 7 Zelda Games in a row. Option 2: Completing the same first 5-Zelda Games… AND adding Majora’s Mask to the rotation. 6 Zelda Games in a row. Option 3: Completing the same first 5-Zelda Games… BUT, when playing through Ocarina of Time, it would be a 100% run, requiring me to collect all the skulltulas, hearts, and various upgrades. At this time, these are the top options I’m contemplating, but I’d like to hear from you all. In any case, I think the marathon will extend to about 28-30 total hours of just me playing Zelda games. I’m confident in my ability to complete this journey. What do you think of these options? I’ve included a poll for you to vote on, but I left ‘Option 4’ as ‘OTHER’. If you have an additional, yet somewhat reasonable idea, I’d love to hear it! Note that while this announcement is coming here in mid-January, the actual mini-marathon will likely not take place until around late March. An exact date had yet to be announced, but I need some time to prepare! Much like last year, it will be a fundraiser event as well, raising money for a very exciting project in the works that I am not quite ready to unveil. Donation amounts and various marks will be needed to be hit in order to keep me playing. More details on this come in a few weeks.